We are very proud to present Barnes, our full scale ExoMars rover model for outreach. Barnes is named after the late Professor Dave Barnes, who began our involvement in the ExoMars mission in the early 00’s. The ESA/Roscosmos ExoMars rover is due to launch in 2020… but what will it look like? How tall is it? What will the instruments do? How will it search for life? 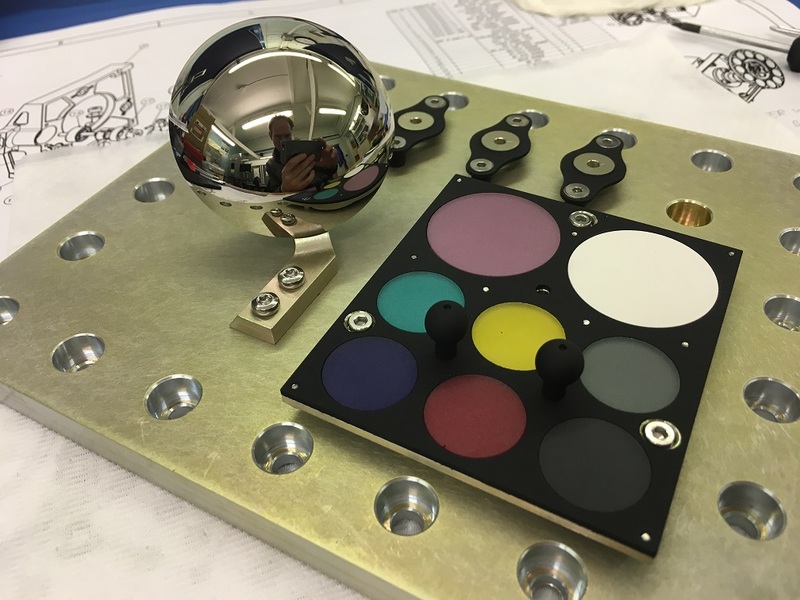 Aberystwyth University is one of several UK institutions with involvement in the PanCam instrument on the ExoMars rover, part of a team led by UCL’s Mullard Space Science Laboratory. Just over a year ago, after spending many outreach events trying to answer these questions, a small team at Aberystwyth began building a full-scale model of the ExoMars rover especially for outreach events. Prototype rovers such as Airbus Defense and Space’s Bridget are occasionally used for public demonstrations, but they are research tools which aren’t designed to represent the appearance of the final rover and can’t be physically handled by members of the public. Aberystwyth University’s rover, Barnes, is being designed as an engaging and tactile exhibit, that members of the public are invited to explore through touch and interaction. Barnes was unveiled to the public by Sue Horne, Head of Space Exploration for the UK Space Agency, and the Barnes development team during the Aberystwyth Robotics Week event “An Evening of Space Robotics”. Barnes is named after the late Professor Dave Barnes, a pioneering space roboticist who worked at Aberystwyth University, leading our contributions to the Beagle 2 mission, and starting our work in the ExoMars mission in the mid noughties. We are hoping the model will continue to inspire people in the way that Dave inspired us. Barnes is still work in progress (you might have spotted that it’s missing some very important instruments! ), but soon it will begin visiting events and schools to inspire people across the UK and get them excited about the ExoMars mission.